The veteran outside linebacker, signed by the 49ers on Monday, will learn soon if he'll be available to play in Sunday's season opener against the Green Bay Packers. 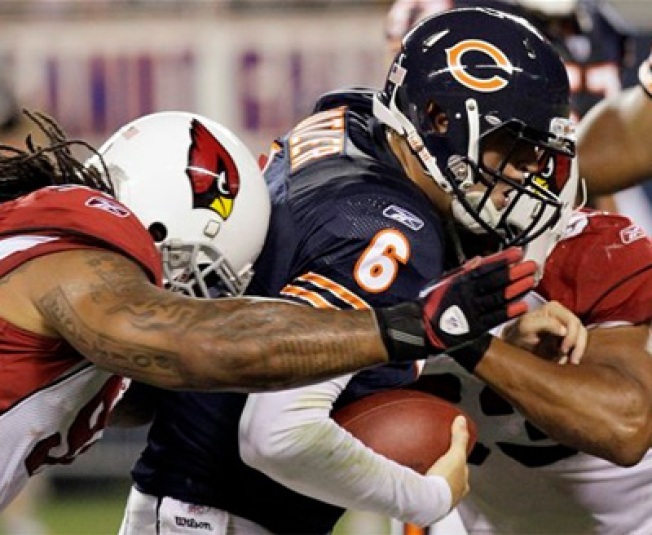 Jay Cutler is sacked by Arizona Cardinals defensive tackle Darnell Dockett, left, and linebacker Clark Haggans, right, during the first half of an NFL preseason football game. Clark Haggans joined the San Francisco 49ers at practice Tuesday pledging to hit the ground running with a team that fits the rugged style he has established throughout a 13-year NFL career. Haggans faces discipline by the league after serving jail time in June after pleading guilty to DUI charges stemming from an April 2011 incident. His hearing before the NFL is scheduled Wednesday. The 49ers certainly could use the services of the veteran with 46.5 career sacks when they face the Packers and a prolific passing attack led by quarterback Aaron Rodgers. Haggans is the only backup on the roster behind starting outside linebackers Ahmad Brooks and Aldon Smith after San Francisco placed 2011 starter Parys Haralson on injured reserve Monday with a torn left triceps. Haggans has played throughout his career in a 3-4 defensive system that's similar to what San Francisco runs. He started 57 games on the edge for the Pittsburgh Steelers from 2004-2007 before moving on to Arizona, where he started 43 games the past three seasons. Haggans started all 16 games for the Cardinals last year, recording 46 tackles and three sacks. After the Cardinals released Haggans on Friday at the final roster cutdown, the 49ers were quick to come calling. Haralson, who started 68 games over the past five seasons for the 49ers, was injured in San Francisco's Aug. 26 exhibition at Denver and underwent surgery last week. The Niners then released four young outside linebackers Friday to reach the 53-man final roster limit, leaving them with starters Brooks and Smith as their only two healthy players at the position. Haggans saw San Francisco's defense evolve into one of the NFL's best while playing the 49ers twice each season over the past four years. Now he's eager to get involved. At 35, Haggans said he still can produce at a high level and is willing to accept whatever role the team has for him. That role could become significant with Haralson gone and Smith in his first season as a starter after setting a 49ers rookie record with 14 sacks last season. San Francisco's defensive scheme places a high priority on getting pressure on passing downs from its edge linebackers, and Haggans has produced five or more sacks in a season six times during his career. His next move is waiting to hear from the NFL regarding a possible suspension that could keep Haggans on the sidelines for the start of the season.